After the great success of her award winning Cin Chili mix, Cindy decided it was time to heat things up a bit. 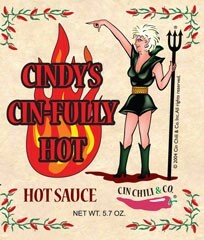 Cindy's Cin-Fully Hot, Hot Sauce, is the result of months of Cin-Ful research. Discover what Cindy did. One drop makes you feel a little cin-ful. Two or more, will bring out the devil in you! Ingredients: Peppers, Vinegar, Spices, Salt, Sugar, Dehy. Onions and Garlic.